Description: With a clean DPU and the first photo of this engine!!! Description: A few of these shots weren't too good because my companions refused to move to the other side. Description: An eastbound stack train moves thru Aubirn Jct. Description: Q157 westbound at NY-76 (So State St). Description: Pan Am SEPO arrives at CPF-200 with CSX 3134 - CSX 890 for power. Description: Q410 thunders up to Nice with an AH pair at 1319. Description: CSX 3134 leads two other CSX locomotives on an eastbound BNSF manifest into Rochelle. The quadrant gates have been newly installed in preparation for the city's Quiet Zone. 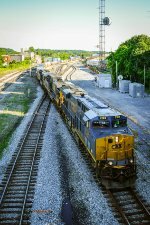 Title: CSX 3134 Heads up a eastbound mixed freight in Fostoria Ohio. Description: CSX train Q606 northbound on the Jesup sub. This train was over 11,000' long and had a single DPU about 2/3 of the way back. Description: One on the move, and another one waiting on a crew change. Description: 1 of 2 triple headers I saw on the rail fan journey. Description: S276-03 is in South Connellsville on Track 1, working a train that stretches back into the yard. Description: UP’s QDYNL-15 (Quality Manifest Dayton, TX-North Little Rock, AR) sits in Dayton Siding. Description: CSX 3134 and 21 wait for NB green with autoracks at Red Oak, GA on December 29, 2017. Description: Q029 drifts down Baker Hill on a rainy sunday afternoon.